We all know that our dryers eat socks. Not a big deal with easily replaceable white socks that my husband wears, but when they're my cute little polka-dotted ones, it makes me mad!! I have a huge collection of cute socks that I've been hoping to find the mates for. But after three years, I've given up. So I showed my dryer who was boss, and I made some cute gloves out of them! In case you have some single ladies in your sock drawer, here's how to make them! Get yourself some inexspensive gloves (Walmart sells a two-pack of these for $1.50, chances are you already have some though!) and turn them inside out. 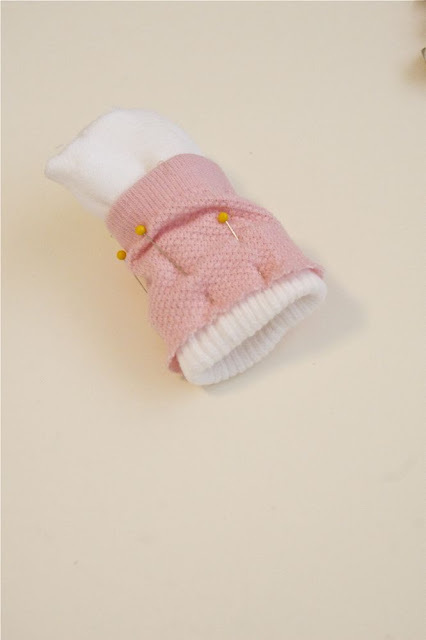 Then take one of the sock pieces and pull it over the glove with the insides facing each other. Pin the sock piece about 1/4" below the edge of the glove band. And sew it on to the glove! 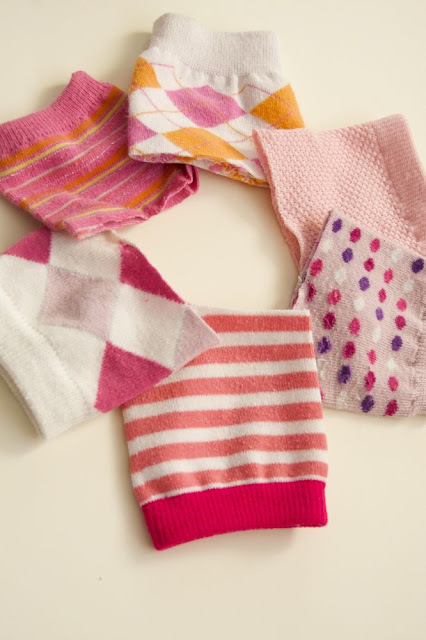 Sew the rest of the sock pieces to each other in the same way, but with right sides facing each other. Add as many as you'd like, making sure that the last one you add has the sock band as the open end, to have a finished look. Then I simply sewed the pom-pom to the top of the gloves! With the extra pieces of the socks that were left over (between the heel and toe), I made a scarf for Paige, using the same methods! Luckily, I'm one of those dorky mom's who loves to match! Oh! And for those of you who were curious, Rhonda picked the long clock face necklace as her giveaway prize! I'm sorry to see it go, but I'm glad she's getting it!! Thanks again to all who entered! I am so happy that I happened upon your wonderful blog. You are so creative! Your pictures are amazing. What kind of camera are you using? I think you might be my new hero! I have two girls and about 20 pink mateless socks! Ok, I love the glove idea but that scarf rocks!! I am going to bookmark ya and share your link with my blog this weekend. I never thought of making a scarf and gloves out of my socks. Great idea and great how to! I love you r pictures. I normally make plushies out of my socks, but I'm going to try this. Kendra: "my" camera is actually my dad's Canon 30D,he lets me use it! I'm hoping to buy a Rebel XSi soon though! Linda: Thanks! I invented the "sock scarf" months ago, only to Google it and find out the the whole rest of the world already knew. Haha, oh well! I love this idea!! I hope I can get around to trying it!! Such a cute idea! Love the gloves and the scarf! Way to show the dryer who's boss!!! I love the gloves...but I especially love the scarf...adorable!!! Oh, and thanks so much for the feature...you're the best! Oh goodness, this is just tooo much cuteness!! If I tried this, it would turn out horrible. So so cute, I know my kids would love so many of the cute things that you make. I wish I had some of your talent.. :) Thanks for sharing. Those are just adorable! I especially love the matching scarf you made! That is such a cute idea! Your daughter is one lucky girl to have such a clever and resouceful mom! So cute!! This is a great idea!! I'm gonna try it!! Argh! Those are so, so cute! I am totally doing this. I'll be linking. Sweet! Wish my mind worked like yours does! Good for you, putting that dryer in it's place. What an adorable idea! You and your daughter are so beautiful! I love seeing pink - especially since I have three boys and my husband! Wow, yet another fab idea! Thanks for sharing! That's such a great idea! I wish I had great ideas like you! I'm still wanting to make knee socks out of those outgrown tights! This would fit right in with that project! Thanks for sharing! Are you serious?? You have the most awesome ideas! This is the first blog I check when I rise. I hope to be as talented as you are someday! Thanks for all the great tutes! You are so talented, thanks for sharing this idea- I love it! Just wanted to let you know I posted your blog on my twitter and have already had numerous friends comment on your site. They love it as much as I do. Wow, Sometimes you and I scare me. I've been working on a tutorial turning old socks into kid's tights because the one sock thing drives me crazy too! This is a GREAT idea. Thanks again for your sweet email! Two little girls and so many sock orphans..the photos on this post are stunning - what lens did you use? Fabulous idea and I would be honoured to have my attempt at the cardi-hat on your "you tried it page"
this is sooo cute! I'm published a link to it on Project K's Facebook fan page. my readers love your stuff! and so do I. I"m glad the winner didn't pick the necklace from your etsy shop that I wanted, I'm heading over there right now to make sure its still up for grabs! good work! and I love your bottom picture, so cute! The scarf is total cuteness! What a cute idea! How do you come up with these things? I live this! I have the mate to your pink sock on the end! lol! I am so making the gloves! You are sooo clever! These are ADORABLE!!! Come share them on Thursday's Treasures! i love crafting ideas that utilize stuff that you might otherwise throw away. i now have a purpose for the little pile of lonely socks i've accumulated. This is so cute! I'm a plain white sock kind of gal, but this makes me wish I wasn't! I love how you take a little bit of nothing and turn it into something fun and spunky and darling - and useful! those are way too cute and your photographs are AMAZING!!!!! Love this idea! My dryer hates me more than yours...it only eats the very uninteresting socks. Random blues, blacks, and browns would not work for this project! However, I do have a pair of knee socks I bought for a Halloween costume (that I will never wear again!) that I know will be perfect for this. Thanks for the idea! So cute! Ok seriously....WHERE do the socks go??? Fantastic!! 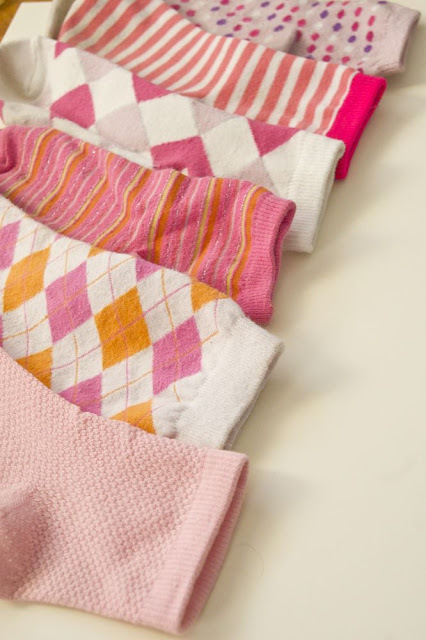 I am so going to do this project I have tons of cute socks with no matches in my drawer! Awesome! Thanks! 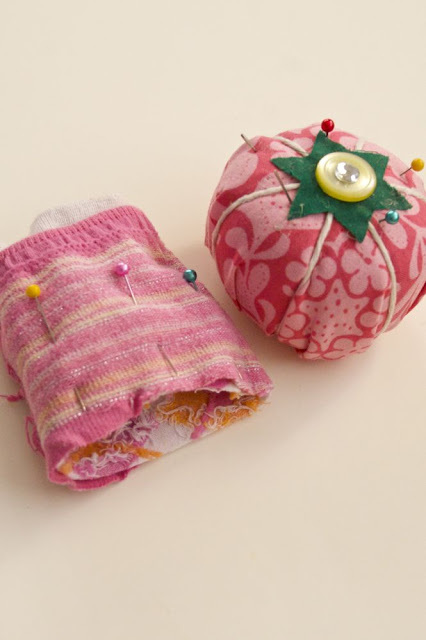 Awesome way to turn all those stray socks into something pretty and useful! Seriously! How does your brain come up with all these amazing ideas! You are killing me with those gloves...they are so freakin' cute! I would so wear those in a heartbeat....way to go again! You are one of the most creative people I´ve seen!! Great idea, I´m going to show my drier who is the boss, too!! Big Kiss & thanks for sharing it!! Those are so cute - the pom poms were the perfect final touch. Too bad I just cleaned out my sock drawer! On another note... where do you find all of your little cable-knit sweaters? Adorable! These are SO FABULOUS!!! I'm raiding my sock drawer today!! what a cute idea, they are adorable! Another great idea, thanks! I have several of these gloves and just this morning, I was lamenting that they weren't nearly long enough for me. Thanks! Oh my goodness, sooo cute, and that scarf is adorable! I hope you had a great Christmas and a Happy New Year. I look forward to following you in 2010. Love you girl! You are way too skinny Disney! 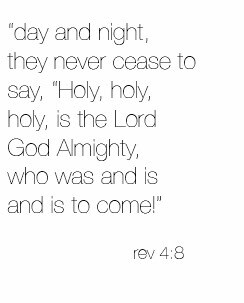 (in a good way). GORGEOUS photography! Love all the happy colors! This has to be one of the best style, economic ideas EVER! 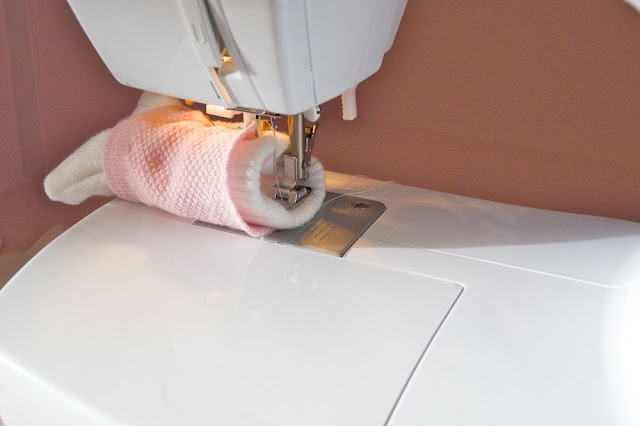 Having three little girls myself and lots of extra little socks - this will soon be done in my house! GOOD JOB Disney!!! Those are so stinking cute.. I love them. what a great photo of the two of you modeling. 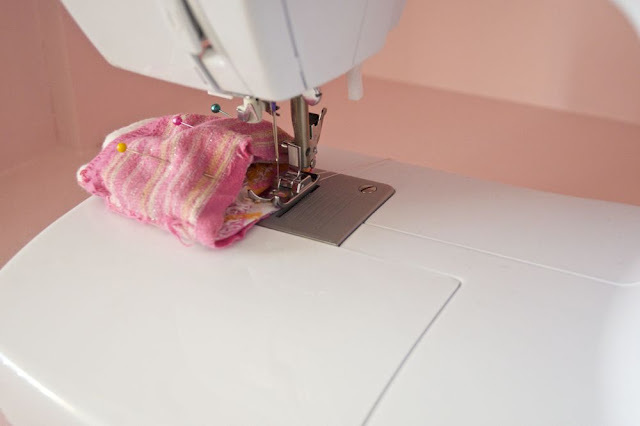 Fantastic idea, I haven't sewn for years, but this is making me want to have another go. I wish I'd asked Santa for a sewing maching this year! Great idea! I just love the sock gloves! Now I have to go digging through my drawer for some mismatches...I think I have quite a few of brown and pink knee highs that I can use! Thanks for your inspiration.... Went out this morning to buy some cheap gloves to pimp!! Now i´m off on an expedition to my odd sock draw... what will i find....?? no-one knows! Thanks once again for being my biggest source of inspiration! oh my goodness~~these are cute projects! I am going to try it...but use my Mom's no sew Sealah adhesive! I love your website and I'm so happy I found it! I love diy, inexpensive, crafts, sewing, everything! I'm going to keep following you to see what awesome things you come up with! Thanks for doing this! how crazy is it that I was looking for things to do w/ this box of odd socks ? yay! now Im super excited!!! Another wonderful and inspiring craft! Thanks for sharing! These are AMAZING. I leave your site delighted with your creations each and every time that I visit! You're a great inspiration.I love checking in on you. I nominated you for an award. I'm sure you get them daily. Check it out. So cute! Now I can't wait for the dryer to eat a few more socks so I can try this. Thanks for the great idea! A silly question, but I am a little novice... Every time I try to sew thick items, my machine snags! I saw you place these two layers of gloves and sock together, and not sure I can do that! What am I doing wrong! Umama: That stinks! Have you tried adjusting the tension? (the directions for doing that should be in your manual, if you have it). That's the only thing I can think of. I hate it when my machine mysteriously messes up! So frustrating! I really like this idea. Forget the mateless socks, I might just buy 3 pair of socks from the dollar store. Oh how CUTE! And YES - I do have a quite a few single socks lying around ... even though I did not own a dryer until two weeks ago! Washing machines eat socks TOO! And I especially love the gloves because ususally the once you buy are a bit short and kinda come out of your jacket (especially the ones my kid has) and leave a bit of skin where you freeze. So this is not only cute - it will make me and my daughter stay warmer! GREAT! Oh - completely forgot: Gorgeous photos!!!! adorable idea! I have many colorful socks like this that I was going to get rid of.. I won't now! I just found your blog last thursday on "stumble upon". You are an inspiration. Looking for more crafts and sewing in the months ahead. LOVE this site! Now, how do we get back at the ironing board??? Disney...I want to wrap you up and bring you home for dinner! (not TO eat, but as a guest) These are just too much to handle. Oh, my goodness! What an adorable idea. I love it!!! Too Dang cute!!!! Love it!!!! You are so smart! These are so cute! Thanks so much for the idea!